By Travis - Argentina - 09 Mar/03 - Viewed 1807 times. Our trip to Puerto Madryn had taken us half the way from Buenos Aires to Calafate in the southernmost parts of Argentine Patagonia, which meant that we had another unbelievably long bus ride ahead. We were to start the trip south around 6:00 PM on Saturday, but decided to travel ahead to Trelew earlier that day, check out the town and connect with our bus on its way south. We arrived in Trelew around lunch time, and unlike the other towns we have visited thus far, Trelew businesses follow the tradition of closing for a few hours in the afternoon, which meant that once we had finished lunch it was a ghost town for the better part of the afternoon. We found some shade in a nice park, and Abi gave me a Spanish lesson. I had been hoping to visit an palentological/archeological site at Trelew that we�d heard about from some other travelers, where fossils from several different eras, climates, etc. are exposed on the side of a large hill�allowing you to travel through the fossil record in a few hundred meters. Of course nothing was open for us to find out about it until it was too late to go there, but I did spend a couple hours at a related museum that had fossil remains from the nearby site and around the world. 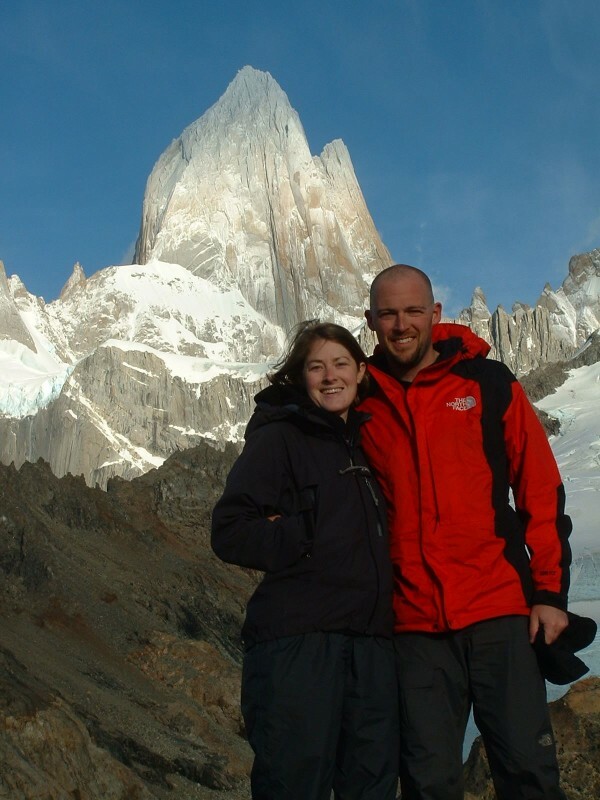 The next twenty-five hours were spent on an overnight bus to Calafate, via Rio Gallegos. We had heard from a number of people that Rio Gallegos had nothing worthwhile, and wanted to connect from our overnight bus as soon as possible. As luck would have it, we arrived at 12:30 PM, and there was an onward bus to Calafate at 1:00 PM. The monotony of the scenery equaled that of our trip to Puerto Madryn, but a combination of better roads and less wind allowed us to get more rest than our first overnight bus ride. Arriving in Calafate on Sunday evening, we had a nice meal, bought groceries for our upcoming hiking trip, and took care of other logistics. First thing on Monday morning we had a four hour bus ride to El Chalten, a village whose sole purpose is to service tourists and hikers coming to get a glimpse of Mt. Fitz Roy and the surrounding area in Parque Nacional de los Glaciares. It was pouring rain when we arrived at the ranger station for our briefing (all the buses stop there on the way into town), and the person there did not give us much hope that the weather would change any time soon (she was right). So, after having one last descent meal, we strapped on our packs and headed out into the torrent. Our first destination was Lago Torre, a glacial lake at the foot of Cerro Torre, one of the most famous and photographed mountains in South America. The hike took a little over four hours and was not easy given the combination of rain, wind, and being terribly out of shape. We were fortunate to have a break in the weather just as we came into the campsite, allowing us to set up our tent and keep our sleeping bags, etc. dry. Being the summer time and this far south, sundown is around 9:00 PM and we fell asleep immediately. A few hours later, a driving rain pelting our tent woke us up, then around 2:00 AM frighteningly strong gusts of wind spawned on nearby Glacier Grande raged down the valley and tore through the campsite, rattling our tent and our teeth off and on throughout the rest of the night. Tuesday morning the rain let up a little, and we went on a short hike or two in the area, but Cerro Torre remained hidden in clouds and rain even during the best periods of calm below at Lago Torre. Even during these breaks in the weather, we were forced to crouch when the wind would gust in order to keep from being bowled over. Tuesday night was a repeat of driving rain and wind coming down from the glacier. Waking up Wednesday morning (Cerro Torre still unwilling to reveal itself), we broke camp during the morning calm, and headed for Cerro Fitz Roy. This hike was also in the four to five hour range, and the last half was in a terrible downpour�do you see a pattern developing? However, this campground was very well protected from wind and rain, with a thick forest canopy offering enough protection from the rain so we could get our tent set up without a problem. Also, most of the tent sites were protected by substantial half-circle shelters on the windward side, three to four feet high and made of brush. A couple hours after setting up camp, the rain worked its way through the canopy and down to the ground, and we had to move our tent a couple of times as puddles were forming near our feet. Having learned from the previous two days that any sightseeing would need to be done in the morning before the rain started at noon, we tried to head up to Lago de los Tres, and the very foot of Cerro Fitz Roy (which, following the lead of Cerro Torre the two previous days, had remained above the cloud bank). We were able to cross one branch of Rio Blanco at a wooden footbridge, but a lesser branch was impassible due to high water from the rains, and we were forced to turn around. We hiked about an hour to Lago Piedras Blancas, a small lake at the base of a dramatic glacier clinging to the side of a mountain. We were about ten minutes away from camp on our return trip when the rain started. We spent that afternoon in a common �shelter� at the camp made out of deadwood and some sheet plastic, which was about ten feet by seven feet and about 70% dry. The people at this camp were much more outgoing than at Lago Torre, and we spent the afternoon talking to camping partners from Holland, Germany, Ireland, Ecuador, and the USA. We all shared a hatred of wet socks and a hope of seeing Fitz Roy the next day. The rain continued that night. Unlike the fierce wind and rain at Lago Torre that bullied and battered us for two nights, the thick canopy of trees tamed the violence of the evening rains. Beyond the edge of the forest, you could see that the rain was strong and steady, but in the middle of the woods only intermittent drips came down upon the tent. That is until a Patagonian gust of wind came upon the forest. As it worked its way toward our spot in the leeward edge of the campsite, it sounded like a long and powerful ocean wave rolling into the shore, building with intensity of sound and motion as it proceeded. The gust would overtake our campsite and rattle our tent as it shook the trees around us, causing the buckets of rain held upon the leaves of the canopy to come crashing down�not in drips, but with the force of the wind propelling it, until it smacked upon the rainfly of our tent with the sound of strings of lady-finger firecrackers being set off on the 4th of July. It was marvelous. Determined to give Fitz Roy another try, we set our alarms for 5:30 so we could make the ascent before the noon rains came. We gathered our water, and made other preparations in the pre-dawn darkness. Then at 6:45, Joy! the summit was visible and we began our hike with the excitement and anticipation of three days of drowned expectations. We needed that motivation too, because the ascent was extraordinarily steep and exhausting (even without our full packs, which were left at camp). Rio Blanco was passable, and we were the first ones to Lago de los Tres that morning by nearly an hour. We took photos of the peak and of each other in all sorts of victorious poses before heading back down to camp with irrepressible smiles on our faces. Upon our return, we had to finish packing up our campsite and have lunch before hiking back to El Chalten. The low-lying areas were still badly flooded, and we had to wade across a marshy area for a couple hundred yards. Miracle of all miracles, it did not rain at all that day, and we had great views of Fitz Roy at several points in the hike (11 kilometers total). On the trek back to El Chalten, we had heard varying reports that a bridge between El Chalten and Calafate had been washed out and bus service was stopped or limited. We arrived in town at 5:30 with some hopes of making the 6:00 PM bus back to Calafate that night, when we learned that the bridge had been washed out by the cresting river, and that the busses were full until the next day at 6:00 PM (they would take a bus-load to the washed out bridge, the people would portage around the areas for about 800 meters, and a bus waiting on the other side would take them onto Calafate). We camped on the edge of town that night, and spent the next day recovering from our last hike. I walked part way to Lago Torre, to try one last time to get a look at Cerro Torre, but the shroud had reclaimed its place and frustrated my efforts. We took the bus to Calafate, arriving at 11:00 on Saturday night and enjoyed our first shower (other than being continually rained upon) in six days. This morning, we hopped on a mini-bus at eight and went to Perito Moreno Glacier, which is one of the most magnificent natural features I have ever seen. After getting a view of the entire glacier from an overlook by the side of the road (the sky was clear and we could see miles of the glacier, all the way up to the mountain peaks from which it originates), we boarded a ferry to tour the front edge of the glacier feeding into the lake. The south edge we passed in front of was probably two miles long and over 150 feet high in places. After the boat ride, we went to an overlook area that offered several different views of the north edge of the glacier. Several times enormous chucks of ice along the north edge of the glacier calved into the lake during the two hours we were there. As dramatic as the photos are, they don�t begin to capture the force of this river of ice spilling, bit by bit, into Lago Argentina. The ice cracks like a whip when it first frees up, then crashes into the water like thunder. Some of the blocks of ice slide down the face of the glacier, like an avalanche, and others swing out from the glacier (as if the bottom of the piece were a hinge) and belly-flop into the lake. Tomorrow morning we are off to Puerto Natales, Chile the staging area for Torres de Paine and another much-anticipated week in the wild.